(Egg woman who defies categorization) (1996). Via Skarstedt Gallery. You may remember MoMA’s “Martin Kippenberger: The Problem Perspective,” of 2009 (brought to New York after success at LACMA), which was a comprehensive and exciting look at the work of a relatively underappreciated 20th century icon. Now, two years later, Martin Kippenberger “Eggman II” at the Skarstedt Gallery on the Upper East side reminds us again that, despite the extreme lessening of scale and comparatively sparse presentation, the German artist’s work is the result of an obsessively productive energy and wit whose motto seems to have successfully been “more is more;” more color, more humor and more personality are evident in this work than most. 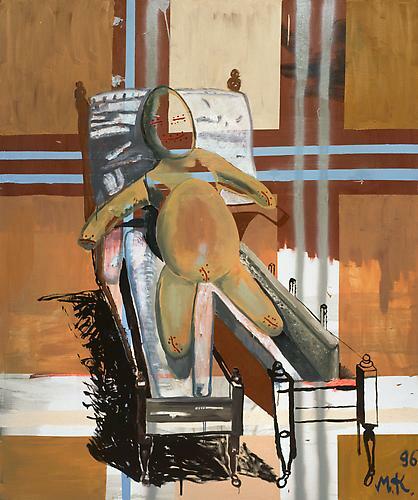 Martin Kippenberger, Die Verbreitung der Mittelmabigkeit (The Spreading of Mediocrity) (1994). Via Skarstedt Gallery. Open until April 16th, “Eggman II” reinforces Kippenberg’s reputation as a strong artist whose attitude was halfway between jester and critic. The show is organized around the unifying character of “the Eggman,” one of the few motifs that carried throughout his multifarious body of work, here represented by a total of 9 paintings, 5 drawings and 1 sculpture. According to the press release, Kippenberger remarked about his favored subject: “The egg is white and insipid, how can a colorful picture come from that?” Though he played dumb, the artist uses “the egg” as a masked commentator or stand-in for art historical references, as in “Untitled (Sick Egg Child)”, which echoes Francis Bacon’s Pope series or “The Spreading of Mediocrity,” which plainly represents a mid-90’s opinion about the development of abstract expressionism. The naïve technique and avoidance of didacticism shows echoes of influences ranging from Philip Guston to Matisse, and is deliberate while maintaining the energy of slapdash composition. 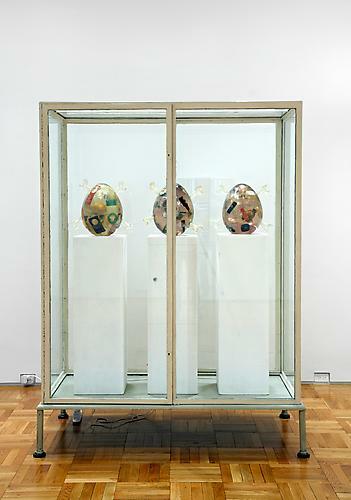 Martin Kippenberger, Untitled (Showcase with egg sculptures) (1996). Via Skarstedt Gallery. Martin Kippenberger, Untitled (Grand Hotel) (1996). Via Skarstedt Gallery. The show is mostly comprised of painting, but also has a few drawings and a single sculptural piece. All include elements of his well-known Hotel works, a series of drawings on pages of various international hotels’ stationery that reinforce the artist’s legend as a lifelong nomad. These quick sketches are necessarily rooted in the place of their creation and are fiercely autobiographical, as is “Untitled (Showcase with Egg Sculptures),” a series of three resin eggs in which hotel door tags and empty liquor bottles are floated. Lest we forget, both series remind us that Kippenberger is widely seen as having been an erratic and tempestuous alcoholic. 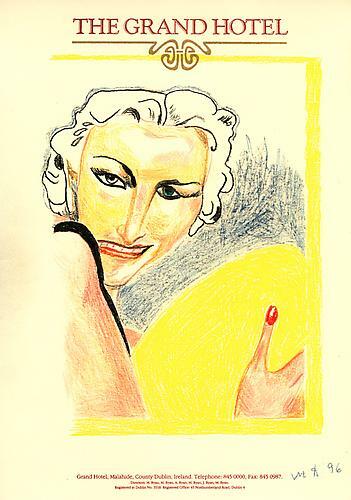 While alive, he was well known for tirades at Berlin bars and nose-thumbing at the art establishment through actions such as being a founding member of the art group Lord Jim Loge, whose first rule of conduct is “Nobody helps nobody,” and going on a “Magical Misery Tour” in Brazil that culminated in his reopening and running a previously abandoned gas station. Martin Kippenberger, Untitled (Sick Egg Child) (1996). Via Skarstedt Gallery. Though Kippenberger was consistently lacking in sobriety both in his work and life, he was nonetheless a sharp observer of culture and questioner of what was to be valued in art-making. “Eggman II” is clear in its focus if not entirely coherent in its curation, and shows brash, mischievous work in an exceedingly tasteful fashion. While it always speaks loudly, it seems relevant to wonder which suits the work better- the overarching and somewhat overwhelming deluge when it was shown at MoMA, or the highly selective themed treasures at Skarstedt. This entry was posted on Saturday, March 12th, 2011 at 5:34 pm	and is filed under Go See. You can follow any responses to this entry through the RSS 2.0 feed. You can leave a response, or trackback from your own site.